At.mosphere Restaurant, 122nd floor, Burj Khalifa, 1 Emaar Boulevard, Downtown Dubai. +971 4 888 3828. 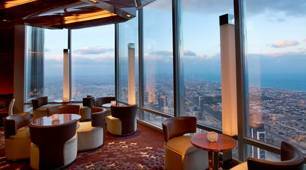 World's highest restaurant at 442 metres in the world's tallest building. Lunch, HIGH tea, dinner and bar service. Astro's Rooftop Bar, 19th floor, Le Méridien Al Aqah Beach Resort, Dibba Road, Fujairah, UAR. +971 224 9000 . Sat to Wed 6pm-1am. Thurs & Fri 6pm-2am. Starwood. 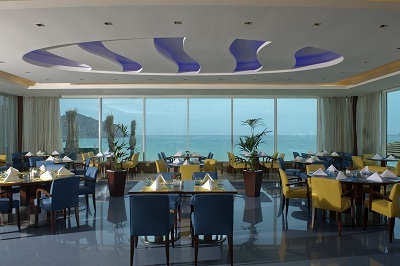 Views Restaurant, Le Méridien Al Aqah Beach Resort, Dibba Road, Fujairah, UAR. +971 224 9000 Daily 24 hours! 360 Bar, Jumeirah Beach Hotel, Dubai. on the roof of the Marina Restaurant. Overlook the coast of the Persian Gulf while enjoying a shisha pipes and light lounge music at 360 the stylish rooftop Terrace Roofdeck of Marina restaurant. For entry before 8pm on Fridays and Saturdays you should register online on www.platinumlist.ae. Please note that in-house guests always get entry. Uptown Bar, 24th floor, Jumeirah Beach Hotel, 3 Umm Suqeim, Dubai. +971 4 348 0000. 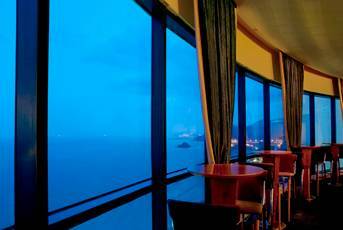 A similarly spectacular sight awaits when you visit the elegant Uptown Bar on the 24th floor. Daily 7pm–2am. 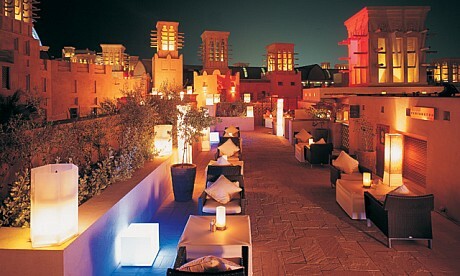 The RoofTop, Arabian Court, One&Only Royal Mirage, Al Sufouh Road, Jumeirah Beach, Dubai. Roof Top Bar & Club. The most dramatic outdoor evening venue, where the sky is the ceiling. Daily 5pm-1am. Vista Rooftop Bar & Restaurant, 5th floor, Holiday Inn Knowledge Village, Al Rigga Street, Sheikh Zayed Road, Dubai 29499. +971 4 427 5500. Two 5th floor rooftop outdoor terraces (one dedicated to Shisha) offer spectacular views of Burj Al Arab and The Palm Jumeirah. Sun to Fri 11.30am-3.30pm. 6pm-11.45pm. 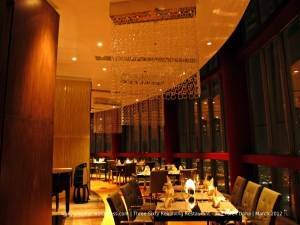 Icho Restaurant, 49th, 50th and 51st Floor, Radisson Royal Hotel Dubai, Sheikh Zayed Road, Dubai. +971 4 308 0000. Japanese. 12 noon-12 midnight. Cocunut Grove, Rydges Plaza Hotel, Al Diyafah St, Satwa Roundabout, Satwa, Dubai. +971 4 398 2222. Stellar rooftop views. Chill Rooftop Lounge & Restaurant, 9th Floor, Royal Ascot Hotel, Shatha Towers, Dubai Media City, Sheikh Zayed Road, Dubai, UAE. +971 4 445 8536. Adjacent to The Chillspa and Chill Salon. Unobstructed sweeping views of both the breathtaking modern Dubai skyline and the contrasting backdrop of old town Dubai. Al Sarab Rooftop Lounge, Jumeirah Bab Al Shams Desert Resort & Spa, Desert Area, Dubai. Next to Endurance Village. +971 4 809 6100. Selection of cigars and shisha. 50kms from Dubai. 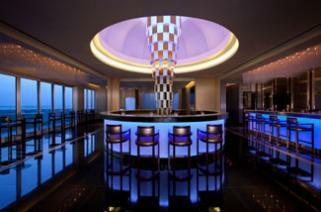 BAR 44, 44th floor, Grosvenor House, Al Sufouh Rd, Dubai. Spectacular views of Dubai Marina and Palm Jumeirah. An exclusive champagne and cocktail bar Chic and stylish with live Jazz & Blues. Fri to Wed 6pm-2am. Thurs 6pm-3am. Starwood. Neos, 63rd floor, The Address, Al Doha Street, Dubai. Open daily 7pm-2.30am.21 years plus only. Stratos, Le Royal Méridien Abu Dhabi, Sheikh Khalifa Street, Abu Dhabi. 800 101 101. 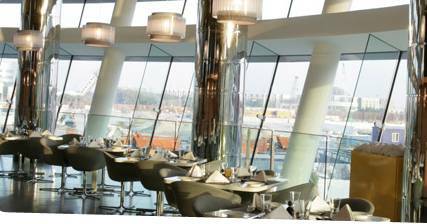 Drink in the unique ambiance whilst taking in the chic interiors and the panoramic cityscape that opens up as the restaurant gently revolves around its 360 axis. 3pm-till late Mon to Sat. Sun-Closed. Children not be allowed from 6pm-closing time. Starwood. Skylite, Yas Viceroy Hotel, Yas Island, Abu Dhabi, UAE. 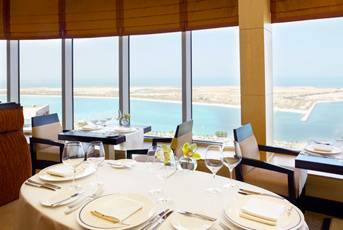 +971 2 656 0000 Its position above a Formula 1 racetrack makes this bar at thea highly sought after locale on race days, especially with the view of the desert landscape and Persian Gulf beyond. Pearls Bar, Shangri La Hotel, Khor Al Maqta, Abu Dhabi, UAE. +971 2 509 8888 Rooftop view over Sheikh Zayed Grand Mosque. Closed during the summer months. Sun to Wed 6pm-1am. Thurs to Sat 6pm-3am. Smoking and non-smoking. Mangroves Lounge, Anantara Eastern Mangroves, Eastern Ring Road, Salam Street, Abu Dhabi. +971 2 656 1000 Enjoy vistas over the swimming pool and surrounding lagoon. Barjeel Heritage Guest House, Al Ghubaiba, Dubai 46500, United Arab Emirates. Roof top dining in a desert city when its sands cool down in the night and carry the soft cool breeze to the waters..
Rooftop Restaurant, Best Western Plus Sand Rose Suite Hotel, Prince Talal Street Cross 19 and 20 Street, Al Khobar City, Saudi Arabia 31952. +966 3 896 22 35 Eastern Gulf city. A panoramic rooftop restaurant offers guests daily sunrise buffet breakfast, all day fine Mediterranean dining and occasional evening features. 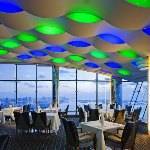 Tree Top Bar, DoubleTree by Hilton Ras Al Khaimah Hotel, Al Jazah Road, Ras Al Khaimah, U.A.E 00001. +971 7 226 0666 Enjoy stunning 360 degree views from the TreeTop Bar while you take a dip in the rooftop swimming pool or enjoy a meal, a snack or cocktail hour. Daily 12 noon-1am.